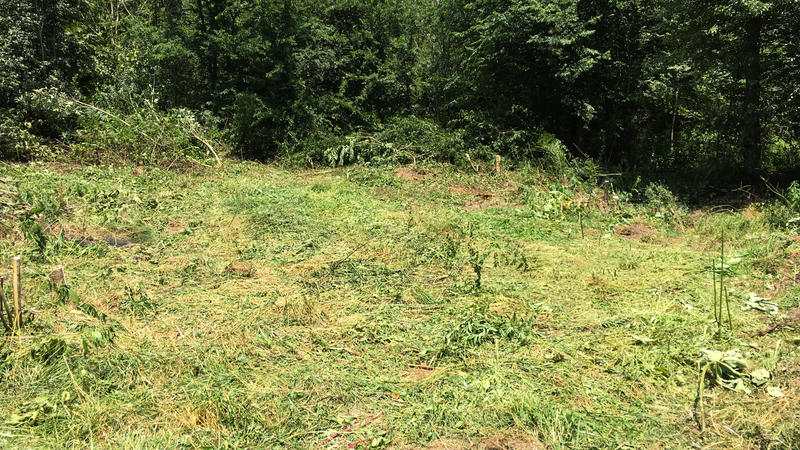 In my last article I told you about easy ways to create large destination plots in timber, and while these large destination food plots should play a role in your hunting strategy, they are often difficult to effectively bowhunt. For this reason, many create small “kill plots” that serve as areas deer will use as a stop on their way to a larger field. The best part about these openings is that they can often be created without the use of heavy equipment that would otherwise need to be rented! Here is how you can create your own small food plots without heavy equipment. Site selection for kill plots is critical, especially when you will be doing the clearing by hand. First, you will need to locate a spot that is free of large trees. While this may sound like a task, every property I have personally worked on has had locations that small food plots could be installed. Brush and saplings can be cleared, but it is probably not worth the effort to clear a spot of mature trees by hand. The shape and size of the plot will likely be dictated mostly by the nature of the existing opening. I like these plots to be anywhere from ¼ to ⅛ of an acre in size, as this allows for bow shots across the opening while still having enough forage to buffer browse pressure from the deer. In addition to the necessity of being already somewhat open, the spot should be located near existing bedding cover. It does not necessarily have to be in a travel path to a larger field from the bedding area, but it should be in the cover. 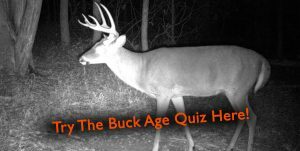 Personally, I like to locate these plots on the edges of bedding areas, as this allows me to intercept bucks cruising downwind of bedding during the rut. However, doing so takes the correct wind direction and good access. The good news is that spots like this are often readily available to clear, as the brushy cover that dominates such locations is often able to be removed by hand. Access is key, but creating small food plots just within cover can lead to great hunting locations. (Above) This location is perfect for a small kill plot, as it is already somewhat open and adjacent to an existing bedding area. Even better, I can easily access this stand by walking through the surrounding pasture. A North or East wind would allow me to hunt without being detected, and also put me on the downwind side of bedding. Such locations likely exist on most properties! (Image from Google Earth). Following site selection, the plot will need to be cleared of brush and small trees. With a little sweat and chainsaw fuel, this is not a terribly difficult task. I typically leave the stumps fairly high, as I would rather see them if I will be using a 4-wheeler in the plot to spray it. I sometimes use the brush from the plot to block certain trails, but try to leave at least multiple openings for deer to get in and out of the plot. Additionally, it is a good idea to treat any stumps with herbicide to prevent them from resprouting in the future. While on this topic, I should note that it is often worthwhile to kill some of the larger trees around the edge of the plot to allow more sunlight to reach the plot. While I would advise against doing this near stand trees for the sake of safety, the easiest way to do this is to girdle the trees and spray herbicide (typically Garlon or Arsenal depending on the species) into the cut. This will allow much more light to reach the plot without the added time of felling large trees. Two additional tools that can be useful are a bladed weed eater and a tractor with a front end loader. The bladed weed eater is more effective than the chainsaw at cutting vines and brambles, which often dominate such sites. It can also be used to cut any grasses and weeds that are present in the plot. The front end loader on the tractor allows cut trees to be pushed out of the plot quickly, but may not be available to some. Even without a tractor, the task of clearing the plot by hand should not be terribly difficult if the right site is selected. 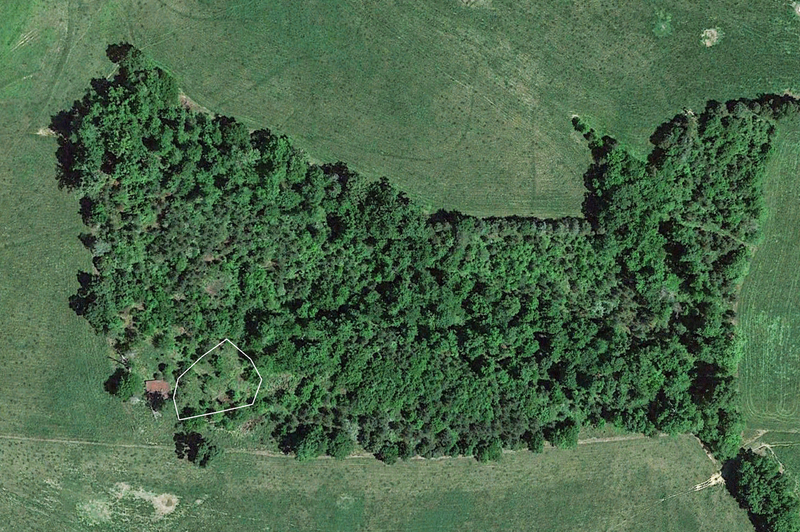 (Above) This small plot was cleared at the location pictured in the aerial image above. While it looks rough now, it will be ready to plant in a few weeks after spraying. These plots don’t have to look perfect right after clearing, and by deer season they should be a carpet of green forage. Once the larger brush and trees are cleared from the plot, all that remains is to spray the plot and plant it. I use glyphosate (RoundUp) to kill the existing vegetation a couple of weeks before I plan to plant. After the vegetation has died, I will sometimes burn the plot to expose bare soil. More often, however, I simply broadcast seed and any needed fertilizer or lime into the thatch and let it work its way to the soil. Given this planting method does not put seed directly into the soil, some thought needs to be given in to what to plant. Any of the cereal grains or clovers work well for this planting technique, but I personally prefer a mixture of cereal rye (NOT ryegrass) and crimson clover. Wheat also works well, but rye is somewhat easier to grow and seems more tolerant of browse pressure. Crimson clover is a fairly cheap addition, and lengthens the time these small food plots are attractive to deer. Regardless, it is best to keep plantings simple in these plots, as they serve as social hubs just as much as a spot to eat. On any property, there are likely opportunities to create small food plots. Proper site selection is key, but with a smart plan for hunting it and a few hours of work, you can create a spot that will pay off for years to come! Thanks for pointing out the importance of finding the right slots for food plots since they must be in a spot that’s free of large trees. I will share with my mother who’s planning to shop for food plots. She mentioned that she wants to have healthy crops in the long run. There’s an area in her lawn that seems to be spacious compared to the other areas.